The Clinical Education Center located at California Baptist University’s Health Science Campus provides language therapy to patients of all ages with speech, language, cognitive, hearing and other communication disorders. The center established in 2016 gives graduate students an opportunity to practice what they learn in classes by working directly with the patients. Students earn hours toward their graduate degree by serving clients struggling with speech and language delays or disorders, autism, hearing impairment, aphasia, traumatic brain injury, stuttering and apraxia. 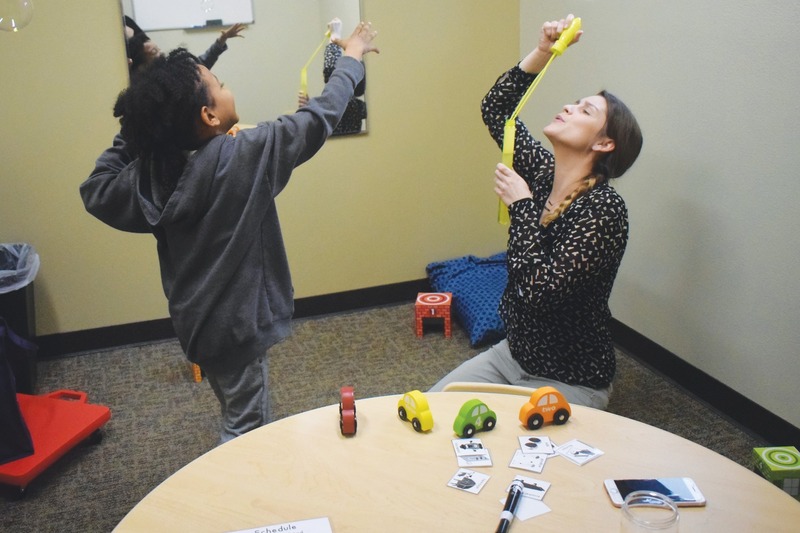 Graduate students cycle in and out each semester as a part of their 400 hours earned in nine different areas of communicative disorders for adults and children, testing and therapy. There are a variety of placements, such as schools, skilled nursing facility and inpatient or outpatient facility to make them a well-rounded clinician. Students spend about 45 hours at each placement, which prepares them for careers working in schools, hospitals or pediatric clinics as a speech pathologist or as a professor. Dr. Danette Bonillo, director of Clinical Education, works with faculty clinical supervisors and students as they perform assessments and facilitate therapy in the center. The facility helps set individual goals to work on with each patient. There is no fee for their services and they are supervised by experienced speech pathologists. “We help a wide variety of patients with communicative disorders who are ages 18 months to 93 years old,” Bonillo said. “We also reach out to the community and provide speech therapy services for people that need them — either their insurance stopped providing it or they need extra help. Brianne Panichakit is the mother of a 2 year-old infant named Holland. She said she noticed her daughter’s speech was not developing and it was hard for her to communicate. Panichakit was recommended by a doctor to take Holland to speech therapy. Since starting therapy five months ago at the Clinical Education Center, Panichakit said she has seen an improvement in her daughter socially, behaviorally and communicatively. The clinic staff is made up of seven supervisors who are professors or professional speech pathologists, 10 graduate students to facilitate therapy and 14 undergraduate volunteers who make materials and help organize those who are receiving therapy. Kayla Pulido, senior communication sciences and disorders major, has been volunteering at the clinic for four semesters. She helps graduate students prepare for their therapy sessions, greets families and helps with office work. “I like being able to see the diverse clientele who come in and see first-hand possibly what I could be doing in the future. All are passionate about what they do. Definitely a program of which people need to be more aware,” Pulido said. Acceptance into the clinic as a graduate student is difficult. Just this semester, the center received 260 applicants with only 27 spots available. Students also provide services in the community at California Schools for the Deaf to provide participation activities. The program gives students an opportunity to adapt and learn versatile skills that benefits them when working with a diverse range of clients of different ages and cases. The work students do while working at the center not only gives them valuable work experience but aids in changing the lives of people in need.